RSA Conference Europe 2011, London - October 11, 2011 - Qualys®, Inc., the leading provider of Software-as-a-Service (SaaS) security risk and compliance management solutions, today introduced a new free audit service to help companies detect and eliminate malware and vulnerabilities from public or Internet-facing web sites. 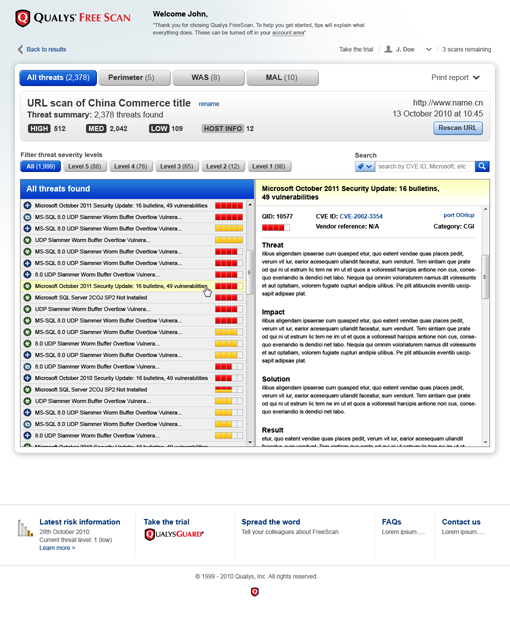 Available at https://www.qualys.com/audit, the free service is called FreeScan and Qualys will showcase it at the RSA Conference Europe 2011 in booth P1 on October 11-13. Web site owners can then review results of the free scans, which include comprehensive remediation instructions in order to fix identified vulnerabilities and remove malware infections. Using an innovative security as a service platform, QualysGuard automates the lifecycle of security auditing, vulnerability management and policy compliance across the enterprise, including discovery, mapping, asset prioritisation, and vulnerability assessment reporting and workflows. The QualysGuard IT Security and Compliance suite delivers customers vulnerability management, policy compliance, PCI compliance, web application scanning and malware detection capabilities in a single unified solution delivered via the cloud. Qualys FreeScan will be generally available in 30 days. Customers can pre-register for the free service at https://www.qualys.com/audit. FreeScan will allow each customer to run up to 10 scans on their web sites or publicly facing IP addresses at no cost. The QualysGuard® service is used today by more than 5,000 organisations in 85 countries, including 50 of the Fortune 100, and performs more than 500 million IP audits per year. Qualys has the largest vulnerability management deployment in the world as a leading global company, and has been recognised by leading industry analysts for its market leadership. Qualys was recently named Best Security Company in the Excellence Awards category of the 2011 SC Awards U.S.